Roma is Alfonso Cuarón‘s “90% autobiographical film” about a middle-class family living in 1970’s Mexico City as seen through the life of their maid Cleo (Yalitza Aparicio). Directed, written, produced, filmed, and co-edited by Alfonso Cuarón this is his deeply personal work of art. Delving deep into his childhood he tells the story of his upbringing through the eyes of his maid and builds an emotion-driven story which will hit you on a number of levels. It took a little while initially for it to really get me hooked on the story and characters but once it does it becomes a gripping and powerful journey. This is a deep and emotionally impactful film that is effective in the story it is conveying due to how rich and vivid of a portrait Cuarón paints of this family living in 1970 Mexico City through the eyes of a fictionalised recount of a real person. This leads to a number of gripping emotional moments that are shocking and will get to you due to how well he explores Cleo and the family through this very sharp and beautifully focused lens. It has a very relaxed pace throughout, letting the lives of these people unfold in a strikingly natural way that at some points is so real it’s almost as if you are peeking through a window to another time at the real lives of these people. The first 20-30 minutes of this movie didn’t grab me as I hoped it would and thus I was trepidatious of what was to come. As developments in the story are made however, I found myself further attached to the characters and what was in store for them. It holds this level of engagement right through to the end in which the story is capped off incredibly well, almost poetic in a sense. The impact of Roma‘s story is credited not only to Cuarón’s efforts, but also the lead performance from Yalitza Aparicio which is astounding from beginning to end. For her acting debut she is absolutely riveting across every scene, many of which she barely speaks more than a single sentence. As the camera follows her through this world she doesn’t need to speak as you can see every emotion and every thought through her facial expressions and body language. She really is incredible and she shines through each and every scene wholly deserving her Academy Award nomination for Best Actress. Aside from Yalitza, Marina de Tavira is the other performer who does stand out in her scenes as the mother of the family. She is good and also brings emotion to her scenes but is eclipsed by Yalitza across every moment. From a technical standpoint this film is phenomenal so there’s no wonder why it received so many nominations for the coming Academy Awards. Cuarón’s cinematography is a character in itself and it’s worth checking out this film for that alone. It really is flawless cinematography. Every shot is perfectly framed and composed and the way the camera moves through and around the sets and characters is incredible. You could rename this film ‘The Art of Cinematography’ because of how impeccable it is in here. The greyscale filter applied over this entire film embeds it in the 1970 time it takes place and further enhances the authenticity of the story being told. There are other films this year with incredible cinematography but I can’t see anything coming close to stealing it from Roma. 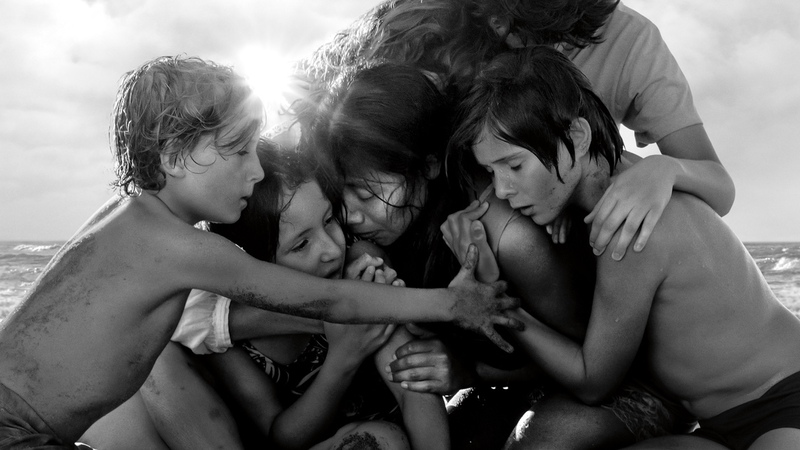 In the end, Roma shines as a favourite at the Academy Awards with an incredible lead performance from Yalitza Aparicio, and phenomenal writing, directing, and cinematography from Alfonso Cuarón. This is a very Oscar-calibre film so if that’s not what you’d typically go for then this might not be for you but being on Netflix it’s worth checking out. It’s one of the best films of the year with an emotional character-centric story that surprised me by how much I enjoyed it.